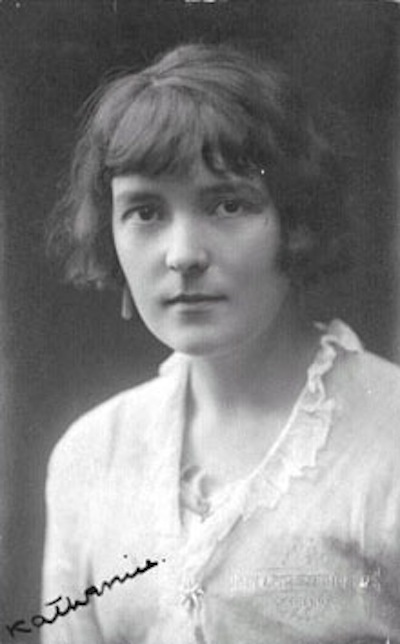 Katherine Mansfield Beauchamp (1888 – 1923) was a modernist writer from New Zealand, born into a prominent family in Wellington. She moved to England when she was 19 years old and matriculated at Queen's College with her sisters in 1903. She was close friends with other modernist writers, including D.H. Lawrence and Virginia Woolf. Mansfield's writing was dramatically impacted by the effects of World War I, when her brother was killed after a demonstration grenade exploded in his hand in 1915. Her grief triggered her most famous stories as a memorial to him and their childhood: The Garden Party, Prelude, At the Bay, and An Indiscreet Journey . Other stand-out works include The Fly, and The Daughters of the Late Colonel. Diagnosed during the war, she died of tuberculosis at the age of 34.